These symptoms can be completely normal, but if they sound very familiar, Femular may be right for you. These medicines may not be right for you. Read the warnings before purchase. These can be found in the recommended dosage and directions section below. Follow the directions for use. If symptoms worsen or change unexpectedly, talk to your health professional. Food for thought: Around 60-80% of women may suffer hot flushes or night sweats during the menopausal transition.1 Find proven relief in our herbal extract of Actaea racemosa. Why are the details important? The finer details of our products help ensure that you can feel confident that you are taking a reliable natural medicine. What you see in clinical studies is what you get in our products. For mild symptoms: Take one Femular tablet daily. 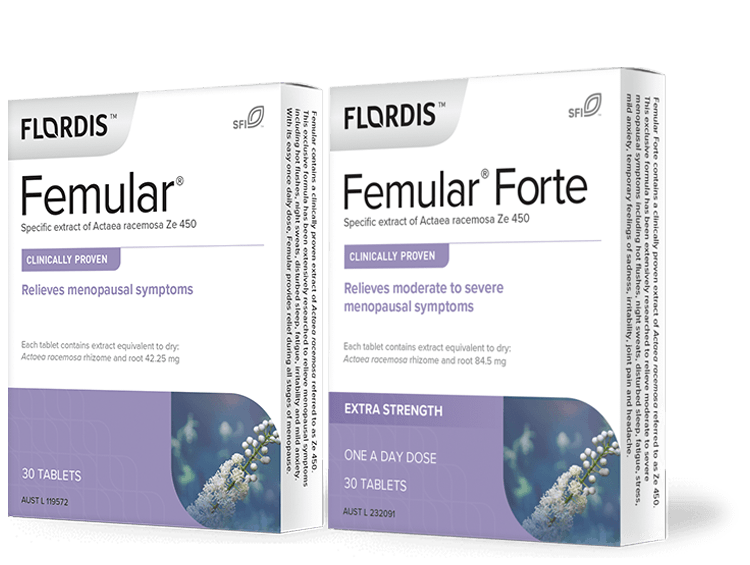 For moderate to severe symptoms: Take 2 Femular tablets daily OR 1 Femular Forte tablet daily. Femular products can be taken during all stages of menopause for a broad range of menopausal symptom relief. Femular and Femular Forte with extract Ze 450 are well tolerated based on clinical research and years of use worldwide. If you have liver disease or a history of liver damage it is important to speak with a healthcare professional before taking Femular or Femular Forte. In very rare cases, Black cohosh has been associated with liver failure. If you experience yellowing of the skin or whites of the eyes, dark urine, nausea, vomiting, unusual tiredness, weakness, stomach or abdominal pain, and/or loss of appetite, you should stop using Femular or Femular Forte and see your doctor. Femular and Femular Forte contain lactose. Black Cohosh can harm the liver in some people. Each Femular tablet contains extract equivalent to dry: Actaea racemosa rhizome and root 42.25mg, which is a dose of 6.5mg of Ze 450. Each Femular Forte tablet contains extract equivalent to dry: Actaea racemosa rhizome and root 84.5mg, which is a dose of 13mg of Ze 450. Femular and Femular Forte are natural medicines that have been shown to relieve the symptoms of menopause from as early as 1 month with significant relief shown at 3 months and continued improvement over 9 months.2-4 We take care to use a specific extract of Actaea racemosa (Black cohosh) known as Ze 450 to help deliver a consistently high quality medicine that is the same medicine proven in clinical trials to provide relief during all stages of menopause. Natural medicines can vary considerably depending on the species of plant chosen, the way it is grown and harvested, the extraction and the production processes. So it’s essential to ensure the product you’re getting is consistent with the one proven in clinical trials to relieve the symptoms of menopause. What is the difference between Femular and Femular Forte? Femular Forte provides the higher dose of Femular in one single convenient daily tablet. 1 tablet of Femular Forte is equivalent to 2 tablets of Femular. This means 1 tablet of Femular Forte contains 13 mg of Ze 450 extract which is twice the amount of Ze 450 extract that is in Femular (6.5 mg of Ze 450 extract). Femular (1 tablet low dose) is suitable for mild to moderate symptoms of menopause while Femular Forte (1 tablet dose) or Femular (2 tablet high dose) is more suitable for those who have moderate to severe menopausal symptoms. Femular Forte is available as a packet of 30 or 90 tablets. Femular contains 30 tablets. Can Femular be used during pregnancy and breastfeeding? Femular is only indicated for use in women with menopausal symptoms. It is not intended, nor recommended, to be used during pregnancy and breastfeeding. Will Femular have an effect on liver function? If you have liver disease or a history of liver damage it is important to speak with a healthcare professional before taking Femular or Femular Forte. Black Cohosh can harm the liver in some people. In very rare cases, Black cohosh has been associated with liver failure. If you experience yellowing of the skin or whites of the eyes, dark urine, nausea, vomiting, unusual tiredness, weakness, stomach or abdominal pain, and/or loss of appetite, you should stop using Femular or Femular Forte and see your doctor. However, Femular and Femular Forte with extract Ze 450 are well tolerated and have been recommended to millions of women worldwide since 2005. Yes, Femular and Femular Forte contain a very small amount of lactose (44 mg) in each tablet. Is Femular likely to interact with other medications? There are no known interactions reported between Femular or Femular Forte and other medications. However, if you are currently on HRT or MHT (hormone replacement therapy or menopause hormone therapy) or any other medicines or therapies affecting hormones, it is not recommended to take Femular or Femular Forte. If you have specific concerns about using Femular or Femular Forte with other medications, it is important that you talk to your healthcare professional. Will Femular affect my ability to drive and use machines? Femular and Femular Forte have no known adverse effects on the ability to drive or use machines. Is Femular suitable for children? Femular is only indicated for use in women with menopausal symptoms. It is not intended, nor recommended, to be used in children. Femular and Femular Forte do not contain any added gluten. How long do I take Femular for? It is important to speak with a healthcare professional if you have specific questions about taking Femular or Femular Forte. How does Femular work? Is it oestrogenic? Should Femular be stopped before surgery? It is important to discuss this with your healthcare professional, including your anaesthetist and surgeon. Where can I find Femular products? Femular products are available from natural health practitioners, selected pharmacies and health food stores. If you go to the Where to buy button above and follow the instructions, you will be able to find a list of practitioners and pharmacies in your area that either stock Femular products or will know how to order Femular or Femular Forte in. Even if your local pharmacy is not on the list, they will be able to order it in for you. Lopatka L et al., Journal of Menopause 2007; 2:16-21. Schellenberg et al., Evidence-Based Comp and Alternative Med 2012. Funded by Max Zeller Soehne AG. Drewe J et al., Phytomedicine 2013; 20:659-666. Funded by Max Zeller Soehne AG. Rhyu M-R et al., Agric Food Chem 2006; 54(26):9852-9857. Burdette JE, et al., J Agric Food Chem 2003; 51: 5661-5670. Funded by NIH Grant P50 AT00155. Naumenko et al., Neuropharmacology. 2011; 61 (8): 1360-1365. Garita-Hernandez, M. et al., Planta Med. 2006; 72: 317-323. Femular® is a registered trademark of Max Zeller Söhne AG.